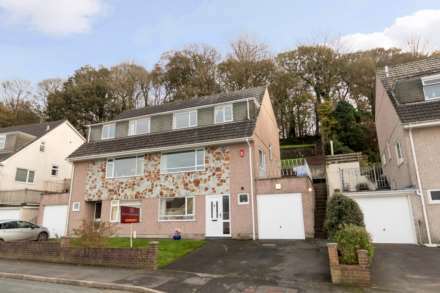 Well presented modern four bedroom family home situated in the the popular tucked away location of Myrtles Close, Saltash. Generous living accommodation is arranged over three levels and comprises, kitchen/breakfast room, lounge/dining room, four bedrooms, three doubles and one single, master bedroom with en suite shower room and modern family bathroom. The property also benefits from two allocated parking spaces, delightful enclosed rear garden, double glazing and gas central heating. Please click on our virtual tour to take a fantastic walk through of the great family home! Wood effect flooring. Radiator. Built in storage cupboard. Feature fire with decorative surround. Feature double glazed box window and double doors leading to rear garden. Coving. Ceiling mounted light point. Radiator. Double glazed window to rear aspect x 2. Ceiling mounted light point. Three piece bathroom suite comprising of a white panelled bath with shower attachment, hand wash basin with fitted shelving and vanity unit under and low flush w.c. Radiator. Extractor fan. Ceiling mounted light point. Radiator. Frosted double glazed window to rear aspect. Pedestal hand wash basin. Low flush w.c. Enclosed shower cubicle with mains shower and oversize head. Access to loft space. Extractor fan. Ceiling mounted light point. Built in Storage cupboard. Radiator. Double glazed window to rear aspect. Ceiling mounted light point.